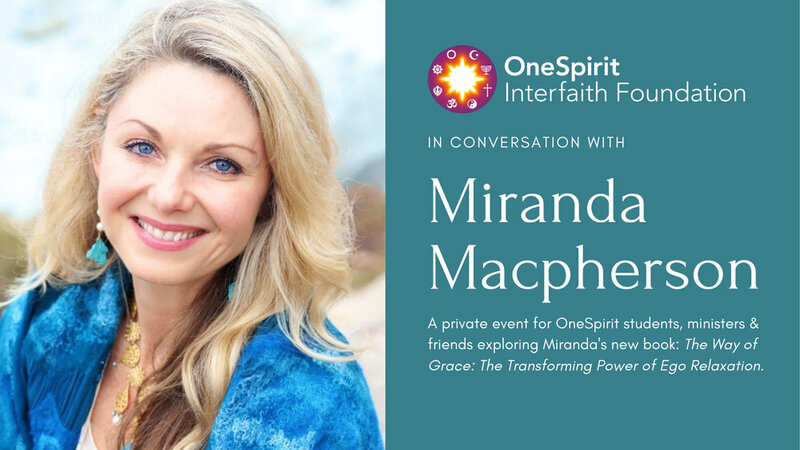 OneSpirit warmly invites all ministers, students & friends to join us for a special evening with OneSpirit founder, Miranda Macpherson in celebration of her new book: The Way of Grace: The Transforming Power of Ego Relaxation. Miranda Macpherson has been guiding others into direct experience of the Sacred for over thirty years internationally. Having completed her own Interfaith Seminary training in New York, in 1996 Miranda founded our OneSpirit Interfaith Foundation where she spent ten years training and ordaining the UK’s first Interfaith Ministers. She teaches and transmits a holistic and feminine approach to non-dual realisation based on the practice of Ego Relaxation, within a tangible atmosphere of unconditional love. Inspired by Ramana Maharshi, A Course in Miracles, extensive study of the world’s mystical traditions, and more recently the Diamond Approach, Miranda’s approach includes inquiry, meditation and devotion, with psychological wisdom. Today Miranda leads the Living Grace Sangha in Northern California, and teaches internationally. She lives in the San Francisco bay area with her husband Bob Duchmann. On her annual pilgrimage teaching across Europe, OneSpirit are grateful for this private audience with Miranda. We warmly encourage you to join us for what promises to be a joyous reunion and inspiring evening together. We offer the following pricing structure in the spirit of trust & generosity, inviting you to purchase the appropriate ticket. If the cost is a barrier for you, please do contact us and we will do our best to support you. For current OneSpirit students only. For current members of ROSIM: Register of OneSpirit Interfaith Ministers.